France's midfielder Antoine Griezmann kicks to score a goal. 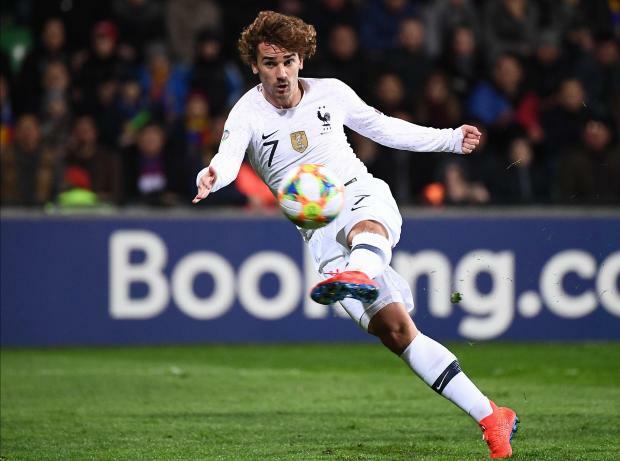 Griezmann had the best of the early chances but his effort from far out failed to threaten Alexei Koselev in the home side's goal after 17 minutes. Griezmann then turned provider, his corner finding centre-back Raphael Varane, who headed to double the visitors' advantage at the Zimbru Stadium. Giroud put to bed when he met late call-up Matuidi's cross a left-footed volley. Giroud missed an opportunity to move ahead of Trezeguet's record 34 goals shortly after the break, when his header from a Griezmann cross flew past the post. Pogba could have added a second assist to Griezmann's account but his header was parried away superbly by Koselev on 70 minutes, and the Manchester United man went close again with 11 minutes left when his shot could only find the side-netting. Lemar's challenge on Eugeniu Cebotaru fed the Paris-Saint Germain forward who easily beat keeper Koselev.